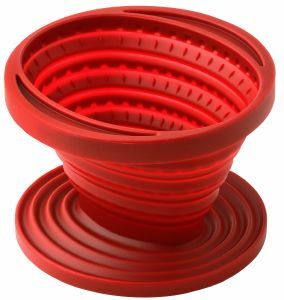 Collapsible red silicone coffee dripper. This fold-flat coffee dripper is ideal for camping and caravanning holidays. Now you can have fresh filter coffee in the caravan or camper van. Easy to store - packs away into a tiny space- just 20 mm high by 113 mm diameter. Expands to 80 mm in height. Will withstand boiling water- safe from -40 C to + 230 C.
Hard wearing - use it all day, everyday and it won't wear out.